Are you ready for iPad’s arrival? With its crystal, vivid, and large high-resolution screen, iPad is the best way to experience any kind of video: from Blu-ray/DVD movies and HD videos to camera/camcorder footage and TiVo recordings. 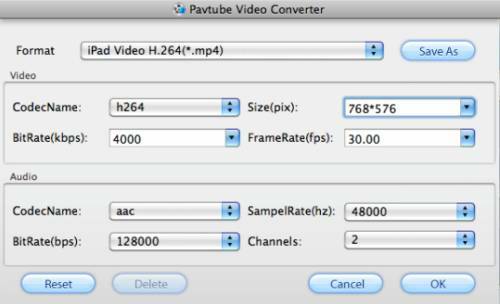 To make different types of videos playable on this amazing screen, what you will need is Pavtube Video Converter for Mac. This tool enables you to convert a wide range of videos for playback on iPad, the source files will cover decrypted Blu-ray/DVD/HD-DVD (.m2ts/.vob/.evo), Camera footage (.mts, .m2ts, .tod, .mod, .dv), QuickTime video (.mov), DVR video (*.tivo), HD and SD video (.tp, .ts, .mst, .avi, .mkv, mp4, .wmv), Flash video (.fiv, .f4v), and more. 1. 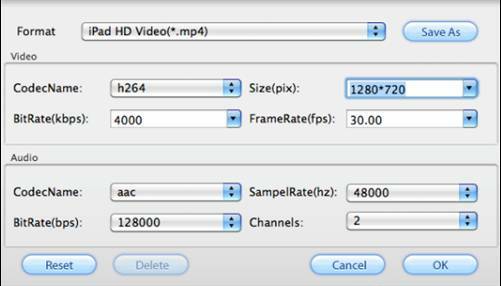 Run this best Mac iPad Video Converter, and click “Add” button to load video files. Hit "iPad" firstly, and then select an output format from the three iPad presets. Actually, all the default settings of this Pavtube Mac iPad Video Converter will guarantee excellent playback quality for iPad, so there is no need to change any one of them. Following are the details of the three default iPad presets. By the way, if you want to join multiple files into a single file, you can firstly load all of these files, and then tick off “Merge into one file” to realize this goal. After the conversion is finished, you can get the transferred video files via clicking “Open” button at the bottom of the main interface. Well, now, it’s time to sync these files to your iPad with iTunes. If you want to edit your videos with this fast Pavtube Mac iPad Converter, you can go to see How to convert and edit movies for watching on iPad. FLV tool for iPad: Convert FLV video for playback on iPad.